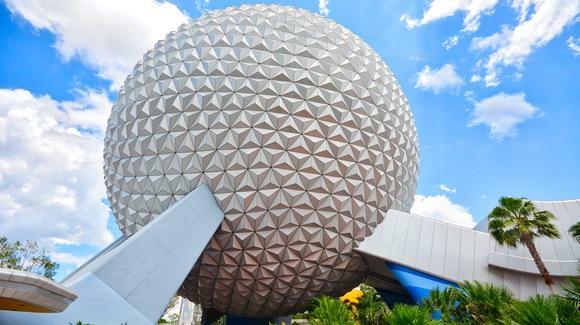 Say the word Epcot to anyone who has been to Florida and you immediately think of Spaceship Earth; it is such an iconic landmark structure. In recent years, its clean lines have been spoiled to some extent by the introduction of the Mickey Mouse hand, wand and epcot logo on the side and the Leave a Legacy structure in front of it. In the summer of 2007, Disney closed Leave a Legacy subscriptions and removed the Mickey Mouse hand, wand and epcot logo from the side of Spaceship Earth. Because of its location just inside the main entrance, it can get very busy in the mornings, but later in the day, you should be able to walk on with little or no wait. It is a continuously loading ride so queues move pretty quickly. You board pods that take you spirally up 18 storeys inside the dome, past AudioAnimatronic scenes showing man’s development in communication from the cave paintings of pre-history, through the ancient Egyptian, Roman, Phoenician and Greek civilisations, on to the Middle Ages and Renaissance, the printing press, telegraphy and then right up to the present day with video phones, interactive TV and virtual reality. The ride lasts about 14 minutes and there are no height restrictions; it is suitable for the whole family. The pod does turn from side to side at times so that you face different scenes and you actually descend backwards but it is not uncomfortable. The end of the ride has also been changed as you descend back to earth, but essentially the ride remains unchanged though it did undergo some minor changes in 2007. It is very tame by today’s standards but that is what gives it its charm. Spaceship Earth is currently sponsored by Siemens AG and the voice of veteran broadcaster Walter Cronkite has been replaced by that of the English actor, Jeremy Irons. However, Siemens are ending their sponsorship deal in October after a 12 year run. Siemens also sponsor the “IllumiNations: Reflections of Earth” laser and fireworks show. The Global Neighborhood where you exit the ride has been redeveloped and is now called “Project Tomorrow: Inventing the World of Tomorrow”. Beyond Spaceship Earth you will find Innoventions Plaza and the two Innoventions pavilions.